You have two ways of recording the transactions depending on the type of supplier pre-payment. Is it quick turn around or will it take a longer time to complete the job or service? 1) When you make vendor pre-payment, use Accounts Payable (A/P) under Account tab. When supplier bills you, create a Vendor Bill in QBO and use an appropriate account. That will clear the vendor pre-payment balance. This is the easy way to enter the transactions especially say if you can record both entries within less than a month. You will then need to match pre-payment and entered Bill to clear the account by clicking Pay Bills tab (Create + sign > Vendors > Pay Bills). 2) You may use this method if pre-payment to the supplier will take longer than 30 days to clear. In order words, for example, you make pre-payment job in January and the job will not be complete until June. When you receive a Bill, enter expense account to be charged. 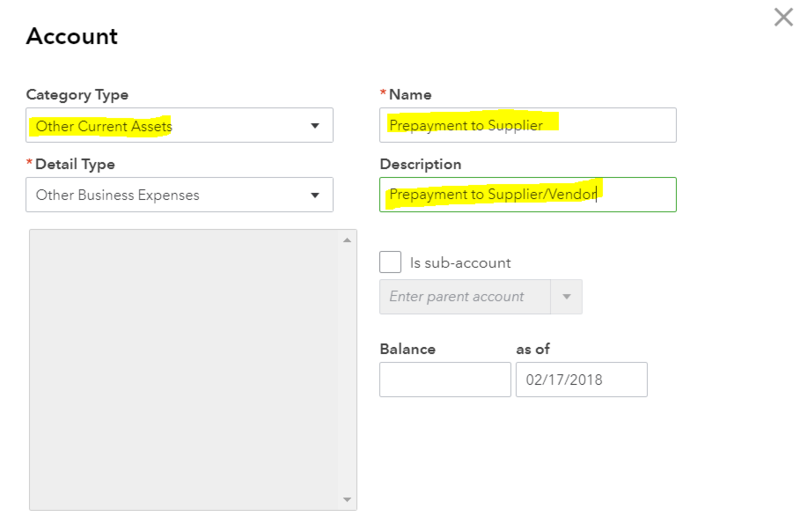 On next line, select Pre-Payment to Supplier account and enter it as a negative amount. If the received bill is exactly the same as pre-payment then, it will net out as zero entry. But if the actual bill says higher than pre-payment amount then, you just make the payment for the difference. That will clear the account. If you have questions, be sure to join our QuickBooks Forum. BUY QUICKBOOKS NOW!!! QuickBooks Online – Anytime, Anywhere. Easily Track Sales, Bills and Expenses.